The Fantastic Fall Fizz The Fantastic Fall Fizz is apple picking, jumping in leaf piles and hay rides in a glass. For grownups. The warm vanilla and caramel notes of oaky bourbon dominate the drink, while spicy ginger cuts through the sweetness. 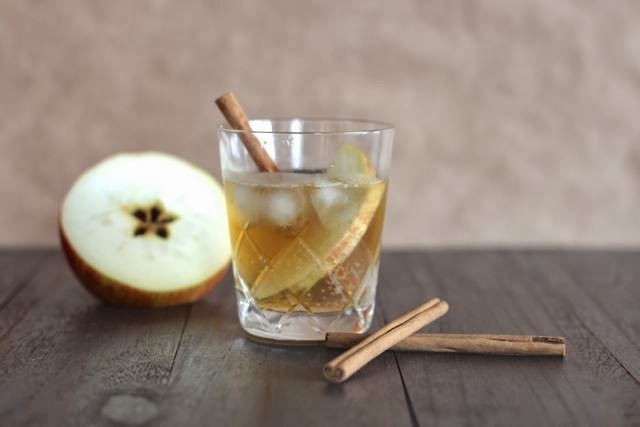 With a hint of apple and a whisper of cinnamon, and this drink is perfect for cocktail hour or Thanksgiving dinner. In fact, you may find yourself inventing things to celebrate just to treat yourself to a Fantastic Fall Fizz. Veteran's Day? Why yes, that is certainly cause for a drink! It can be tempting to skip garnishes sometimes. They can seem a little fussy and add an extra step between you and happy hour. But we urge you not to leave out the cinnamon stick and apple slice in this particular cocktail! They really add to the sensory experience of this drink. You catch a whiff of spicy cinnamon and sweet apple with every sip, turning a delicious cocktail into something special. Not to mention the reward of a bourbon-soaked apple slice when you finish your drink . . . bonus! For the ginger ale, we prefer sharp and dry over syrupy and sweet. We love Bruce Costs's Fresh Ginger Ginger Ale, which you can find at Whole Foods or Cost Plus/World Market. It's zingy, with a clean ginger flavor and pieces of real ginger floating in the bottles. For the hard cider, we tried several different flavors and found that you pretty much can't go wrong! Our favorite was a cranberry-flavored one from Old Mout Cider, but we also loved pear cider and good old-fashioned apple cider. You could use regular (not hard) cider if you prefer, but we liked the extra bubbles that came from using the hard stuff. Combine the bourbon, ginger ale and cider in a rocks glass over ice. Garnish with the apple slice and cinnamon stick. Enjoy! This sounds great, can't wait to give it a try this season!